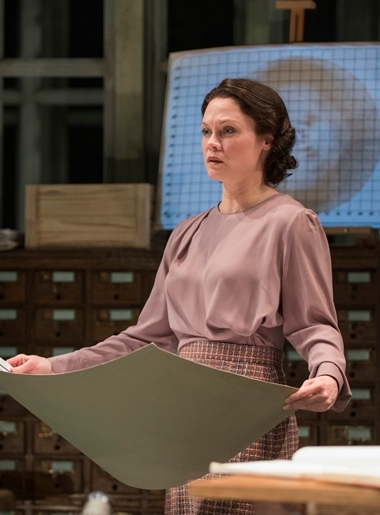 Anna Ziegler’s play “Photograph 51,” now precisely imaged on stage at Court Theatre, is a high-intensity portrait of Rosalind Franklin, the British scientist who played a key role in discovering the double-helix structure of DNA – but was omitted from the picture when the men around her received the Nobel Prize for that landmark breakthrough. Image patterns from her DNA photos may reveal the secret for Rosalind Franklin (Chaon Cross). It is, alas, a preachy play, narrow and agenda-driven, depicting Franklin as fundamentally obsessive and closed: in other words, much like the male scientists around her, though in this myopic drama the boys are represented as cartoonish, self-serving exploiters, the very emblems of that au courant term of contempt, toxic masculinity. Still, Chaon Cross deserves great credit for her crystalline portrayal of Franklin as a brilliant scientist who lands in a bastion of smug male superiority – Cambridge University in the early 1950s – and realizes that it’s either isolate herself in work or end up making coffee for the guys. Franklin thinks she has been lured from her research in Paris to pursue her trail-blazing work on DNA independently, utilizing all the resources that Cambridge has to offer. 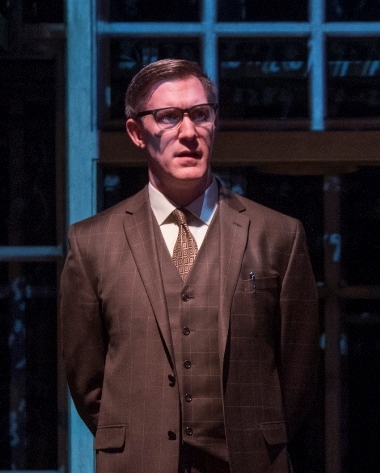 She’s quickly disabused of that idea when she is greeted by her new colleague Dr. Maurice Wilkins (Nathan Hosner), who addresses this female PhD as Miss Franklin and sharply rebukes her when she pointedly calls him Mr. Wilkins. It also becomes instantly clear that Wilkins expects to supervise Franklin’s work and essentially assume ownership of whatever proves of value. But Franklin has no intention of reporting to anyone, nor does she wish to negotiate an accommodation to male hegemony. Categorically rebuffing Wilkins’ assumptions, she withdraws into her own work space and effectively closes the door behind her. 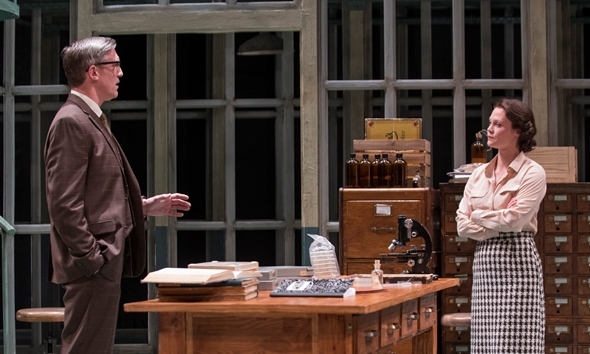 Dr. Wilkins (Nathan Hosner) explains to the surprised Rosalind Franklin (Chaon Cross) that his authority extends to her work. And that’s how it goes: the astonished, befuddled Wilkins hovering, fretting, occasionally venturing into Franklin’s dangerous lair, where she labors day and night to perfect the X-ray photography that might produce a first clear image of the structure of DNA. The key to the secret of life. 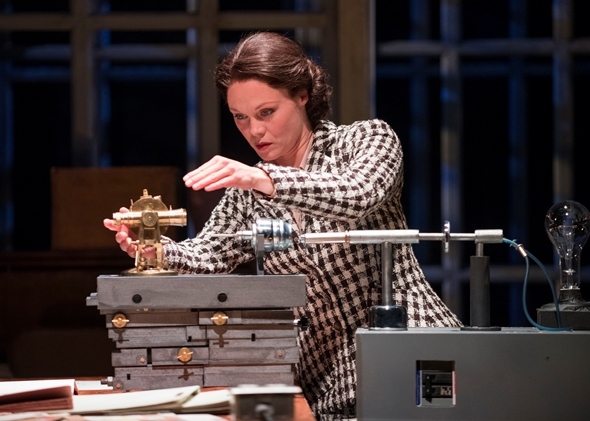 Hosner offers an agreeably flummoxed old physicist, capturing the pathos in Wilkins’ inability to see this female interloper for the dazzling, imaginative, hell-bent scientist that she is. Slowly, however, the besieged Wilkins begins to comprehend the woman as a fellow human being, a creature whose rough armor perhaps belies gentler qualities. Esteemed scientist Maurice Wilkins (Nathan Hosner) has met his match and then some in his headstrong new female colleague. But the workaholic Franklin will not relent. When Wilkins suggests that, if they can’t work together but must occupy the same lab, they might at least be friends, Franklin snaps back: “I don’t want to be your friend.” If she is to be denied an equal place in this male dominion, she will shun them all and prevail alone. Unhappily, that posture and circumstance defines and limits the range of Ziegler’s play, which descends into repetitive harangue on the one side and shallow caricature on the other. The more men we see, the more skewed grows the play’s perspective. A sitcom character crops up early in the lab assistant (played by Gabriel Ruiz) whose services – and loyalties – are split between Wilkins and Franklin. The assistant’s many comic one-liners punctuate the tension between the two scientists. And a young admirer of Franklin from afar, a doctoral candidate (Yousof Sultani), solicits her counsel with great deference only to show up at her lab, newly robed, and address her as Miss Franklin. In one of the play’s best lines, she replies with a sigh that he has gained his doctorate at the cost of hers. The most troublesome cartooning touches the American molecular biologist James Watson, who sees Franklin’s Photograph 51 of the DNA strand and instantly grasps a larger implication that has escaped her. In brief, he runs with it, sharing credit with both Wilkins and Francis Crick (Nicholas Harazin), Watson’s fellow researcher. The three men jointly accept the Nobel Prize. Franklin, whose elegant photography made the breakthrough possible, is shut out. What’s wrong with this picture is the play’s depiction of Watson (Alex Goodrich, apparently doing quite well what director Vanessa Stalling has required) as little more than a flamboyant cad with an overweening cowlick in his hair, an opportunist whose genius and labors are but vaguely intimated. Watson observes that Franklin could be attractive if she would just use a little makeup and do something with her hair. So, let’s say historically, Watson was an envious, even conniving sexist cochon. It doesn’t help the play to turn him into Elmer Fudd. The multilevel set, designed by Arnel Sanciano, creates a world of flexible distances, and the lab itself has the proper sparseness and yet sufficient detail to provide a creative haven for Franklin. All things considered, she seems doggedly happy there.